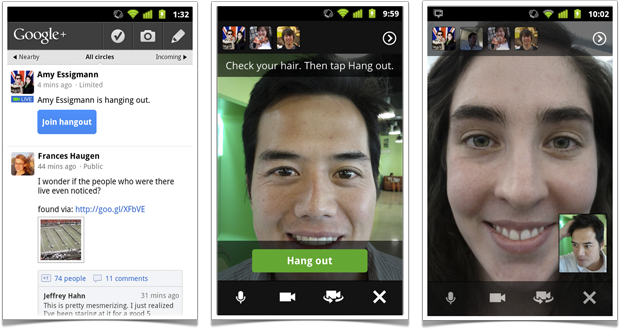 Google+ Adds Mobile Group Video Chats: Will Facebook Ever Come Hang Out? Google+ plans to let users of the social network broadcast video to circles of friends. Your move, Facebook. Google today ramped up its social network Google+ by opening invites to the public and adding a slew of new mobile features. Two of the more impressive upgrades relate to Hangouts, the group video-chatting service the search giant has made core to its social offering. Some have suggested Hangouts could be Google’s “killer app,” and clearly the company has heard loud and clear, as SVP Vic Gundotra unveiled on Tuesday mobile Hangouts and Hangouts “On Air,” a service that lets users broadcast video to a large audience. The more Google+ continues to invest in group video and Hangouts, especially in mobile, the more we wonder how Facebook will react. The world’s largest social network rarely lets competitors gain competitive advantages, especially one as large as Google. (Just look how Facebook has reacted to smaller threats from Groupon, Foursquare, and Instagram.) Facebook rolled out its Video Calls with Skype service back in July, a feature that integrated Skype directly into Facebook and its 750 million users. The Skype partnership, however, only enabled one-on-one video calls and wasn’t mobile. Then again, Facebook has its big f8 developers conference coming up, during which some big announcements are expected. USA Today, for one, indicated video-sharing and video-chat would play a big role at the conference, to stave off the growing threat of Google+. F8 kicks off Sept. 22 (we’ll be there). Google+ is showing off its Hangout On Air with host, pop music thing Will.i.am on the evening of Sept. 21.